In 2018 the Bugatti Chiron came out in LEGO Technic. It’s quite a complex model, but very dense and seems inefficient and consequently negatively impacts some of its functions. Time for a redesign thus where the starting point was to keep the same modular build with almost identical interconnection points, and keep the overall looks in tact as much as possible. 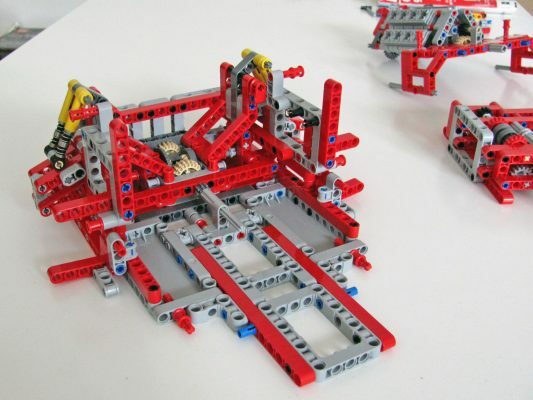 The objective was to reduce primarily parts and subsequently weight, while trying to improve the structural integrity without jeopardizing buildability. Ideally a piece fulfills more than one function. When trying to improve a design, my method is to analyze the current model in detail first and then to ask for each section/ part what the purpose is or why it is needed. “What is this part doing here?”, “Is this part really essential? !”, “Can it be done in a different way?”, ” Can several parts be replaced by one?” are just a few common questions I ask myself. The crossbar looks crammed in place with a lot of small parts to establish the connection and the odd position of the bar itself (half module offset in height). Due to interference with the engine module which has to be inserted from the top now, instead of from the front which seemed to be the plan initially. This assumption is made on the odd 5M axle in step 196 and 198, which could have been part of the engine module if this was inserted from the front. 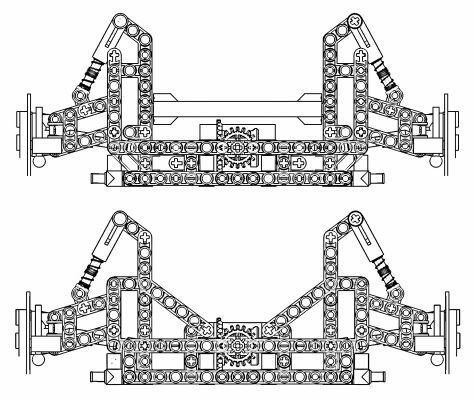 The 13M beam in step 173 was probably initially part of the rear axle module, likely after step 63. The fact that the whole gearbox is also inserted from the front. The crossbar reduces the flex problem only a little and can be considered a poor solution from a mechanical point of view. Allowance to insert the engine module from the front. The image above shows the original design together with the redesign. This new solution allows for the engine module to slide in from the front and at the same time increases rigidity by triangulating the structure of the suspension arms. Another major benefit is that the diagonal beams are doubled up as seen in the image below, reducing the internal stress significantly, while adding further rigidity. In the redesign the suspension arm module now takes care of all the load by itself due to the integration of the angled beams, whereas the original design is heavily depending on the additional crossbar (which is another indicator that this crossbar was added late in the design process). The redesigned rear axle is perhaps slightly heavier, but this is a small price to pay considering the extra strength, the reduction in parts and an easier assembly process overall. 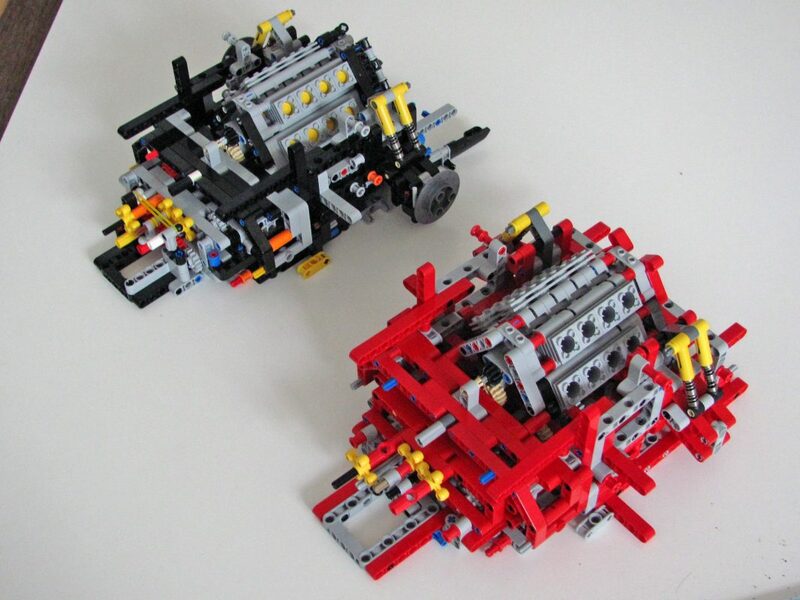 The plan for next time is to look at the redesigned gearbox presented at Eurobricks (which was copied pretty much 1 to 1, because of its near optimized design) and its beneficial implications on some other parts of the rear section.